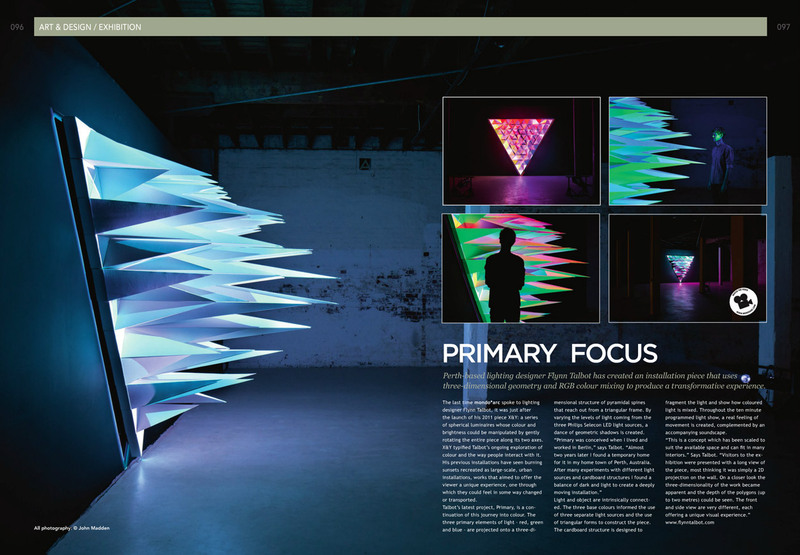 Lighting designer Flynn Talbot recently exhibited a new lighting installation called Primary, which I photographed at PSAS gallery in Fremantle. Spotlights project red, green and blue lights onto a polygonal structure in various combinations and intensities. The 10 minute long sequence is accompanied by a soundscape (also by Flynn), which together with the moving and overlapping colours, aims to create an immersive experience within the gallery space. Spread below is from Mondo*arc magazine, and the Dezeen article can be found here. A new exploration in colour and light. Primary is a three sided wall installation which is illuminated by three LED light sources. This is a reference to the primary colours of light, red, green and blue (RGB). These base colours of light have defined the quantity of light sources and the use of triangles. Everything in threes. The cardboard structure is designed to fragment the light and show how coloured light is mixed. Light and object are intrinsically connected.